Gone are the days of spreadsheets and ledger books. This is budgeting for the 21st century. Stay on the same page as your spouse. Check your balances while at the grocery store. Use our tools to plan future spending. 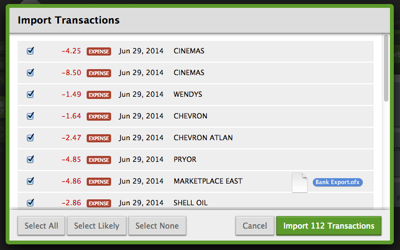 Import transactions from your bank to save time. Never lose data to a hard drive crash. 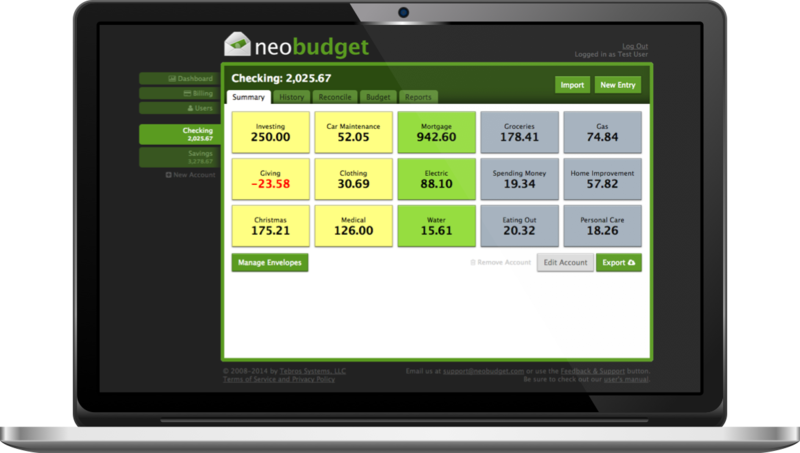 Rather than just showing rows and rows of numbers, NeoBudget presents your information in virtual envelopes that you can see. 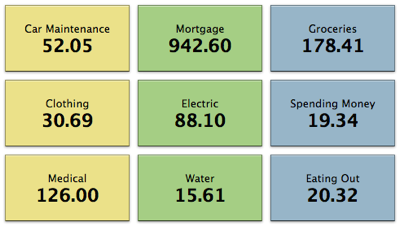 This helps you visualize your budget better by using subtle visual cues that stick in your brain rather than using mind-numbing lists. Often when shopping at large stores your final purchase will include items from many different envelope categories. 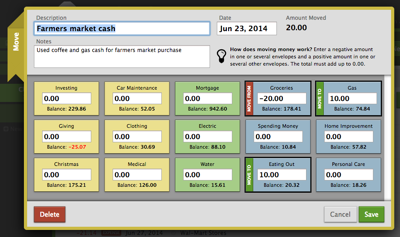 NeoBudget makes it easy to split transactions to be partially funded from many different envelopes at the same time. Easily organize new transactions by dragging them on top of their envelopes. 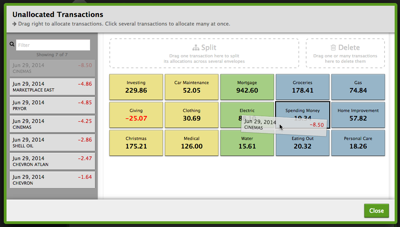 Drag several transactions at the same time to send them all to the same envelope, or drag a transaction to the "Split" area to split it across multiple envelopes. 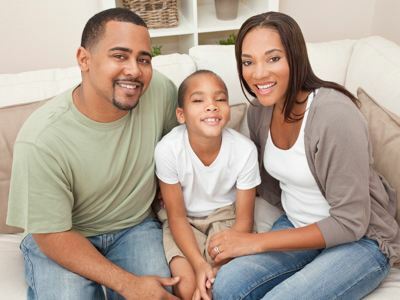 Download transactions from your bank and upload them to NeoBudget. This will save hours of time rather than manually entering each transaction. We detect duplicates, including transactions that you may have entered manually, so you don't need to worry about the date ranges you import. Only new, unique transactions will be imported each time. 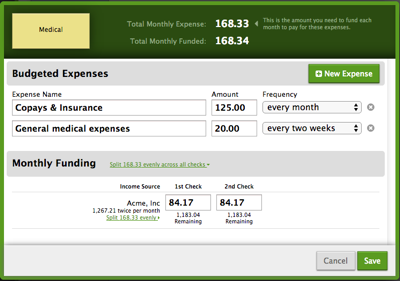 Use the advanced budget calculator to figure out how much money you need to save from each paycheck to meet your goals. The calculator lets you tally up many expenses over different frequencies and gives you one target amount to fund each month in each envelope. If you fund that amount you know you'll meet your goals. Thank you so much for this fantastic program. I am now able to give my deployed husband a way to see our financial envelopes any time he has Internet access. What a huge blessing it is to give him freedom to keep up with family finances even from a world away. It will be an encouragement to him to be able to see first hand how we are coming along with our goals. 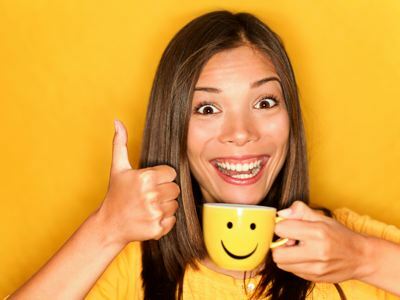 Thanks to NeoBudget, my wife and I don't have to worry if there will be money at the end of the month for bills. Because we set up a plan using the budget editor, we know our expenses are covered. The best part is that NeoBudget much cheaper than the everything else. I just budget it out of the spare change that is left from each paycheck. I have used other programs and they were okay but didn't clearly allow me to see what budget categories were negative. Plus I would tend to forget to update them regularly but NeoBudget is so fun that I want to update it all the time. NeoBudget tells me right on the homepage with bold red letters if I am negative in any envelope.